Universal City as seen from the Santa Monica Mountains. 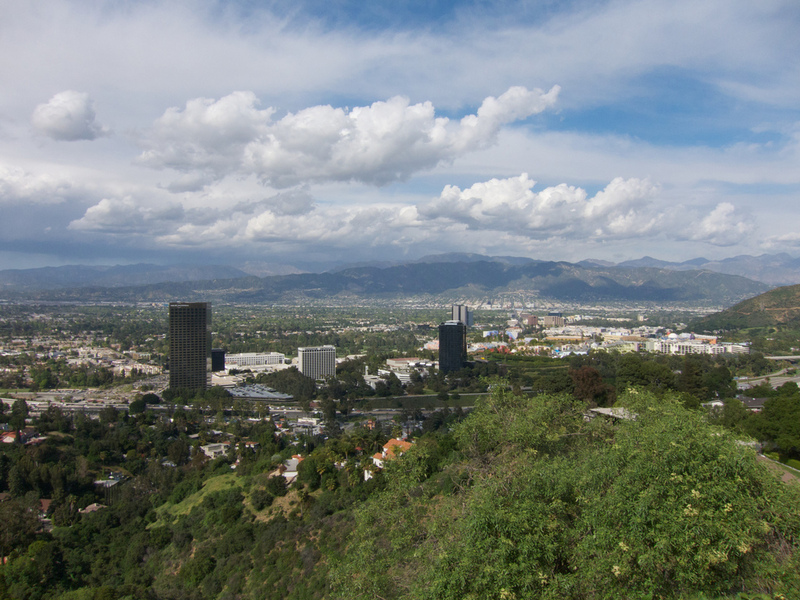 Some would argue Studio City is also seen in this photo, others may argue it’s not. Photo by The City Project, via Flickr creative commons. Pity the poor tourists of the future. One of the most short-sighted and, frankly, minor-league things about Los Angeles is that today’s politicians too easily give in to the urge to name things — buildings, freeway legs, intersections — for people. Alive or dead, famous or not. Now you can add to this bush-league trend the naming of transit stations. You might think that, like in London or Paris or New York or San Francisco, the names of stations would generally be reserved for labels that help riders figure things out geographically. Well, not so much in LA going forward. My understanding is that there will be some signage changes in the Metro system but in communications with Metro riders — especially when space and/or time is in short supply — the geographic names of stations will be emphasized. To be consistent with direction from the Metro Board, we’ll call the Red Line Universal Station by its new name — Universal City/Studio City. But we’ll also try to frequently remind readers that the station is actually two miles from the heart of Studio City at Ventura and Laurel Canyon, where many of the area’s good restaurants are. It’s about a 12-minute ride on the 750 Rapid Bus from the Universal City/Studio City Red Line station to downtown (for lack of a better term) Studio City. This editorial notes that no surface route was included in the Alternatives Analysis for the SR-710 Study that was released late last Friday. The AA recommends five alternatives for further study in a formal draft environmental impact/statement and only one of them involves closing the gap in the 710 between Alhambra and Pasadena — and it proposes a tunnel. The Star-News says that after decades of fighting about closing the gap, this means that the surface option — last killed in the 1990s — is finally dead and not likely to reanimate. As a result, it would like to see: 1) the state of California finally sell properties it has been hanging onto for years in case the freeway was built, and; 2) the Arlington Gardens land protected through a zoning change by Pasadena. Transit blogger Dan Weitzel has an intriguing (and likely expensive) proposition: building a tunnel under Santa Monica Boulevard in West Hollywood, allowing the Rapid Bus to bypass the often clogged street above. Dan says a tunnel in downtown Seattle could serve as a model and that perhaps the city of WeHo could use bonds to finance the tunnel itself as such a project is not in Metro’s long-range plans. I believe it currently takes the 704 about 10 to 15 minutes to travel through WeHo. There’s already wi-fi in some parts of the BART system, but it’s weak and sporadic and the Chronicle says it has generated more complaints than good will toward the rail agency. Now BART is considering a plan to add security cameras to rail cars that essentially use wi-fi to send images back to BART’s security center. The same wi-fi may be made available to riders. A nice profile of Geechee Dan, the frequent singer who has graced a variety of subway stations in Manhattan since 2000. At 72, he’s lived quite the life and still performs as part of a band although the subway supplies him with regular crowds. Check out the video. West Hollywood should consider a street car like the project Downtown LA is doing. I am in favor of investing the resources in renaming stations if it makes things clearer for users of the system. Many of those stations that were renamed recently on the Blue, Gold and Green lines make sense, since if that’s the community in which the station is located, then that should be its name. However, naming stations after people does not make things clearer. I believe putting a plague or a statue near the station entrance would both commemorate the person and maybe even create a landmark where users riding Metro from different parts of the county can meet up. Couldn’t agree with you more here. Tax dollars should not wasted to rename stations over and over again to commemorate politicians. If these people want to commemorate their friends in their political circle, they can do it with private donations and set up a plaque or a statue instead.